The SilkBrite Concentrate and Trigger Sprayer Combo Pak includes one (1) 16 ounce SilkBrite Ready-to-Use Trigger Sprayers and one (1) Quart of Super Concentrate. 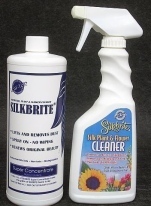 The concentrate makes eight (8) Gallons of SilkBrite silk plant and flower cleaner, enough to fill the trigger sprayers 64 times… And less packaging reduces your carbon footprint. SilkBrite also cleans Wicker Baskets and Dried Arrangements too!